Friction stays are easily changed on Upvc windows, even if the hinges are of a different make they will work perfectly as long as you choose the same length and stack height. We always advise changing both stays at the same time, this is why we always sell them in pairs. Friction stays are easily changed on Upvc windows, even if the hinges are of a different make they will work perfectly as long as you choose the same length and stack height. We always advise changing both stays at the same time, this is why we always sell them in pairs. Even if one friction stay is ok it will break down in time. 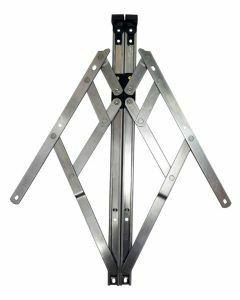 Fire escape or egress hinges have become more popular over the last few years as they provide a means of escape in the event of a fire because they open up to an almost 90 degrees opening. They are only available as side opening and often include an easy clean facility particulary useful for cleaning the outide of the glass. 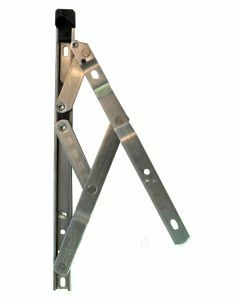 Fire escape window hinges are sometimes called a means of escape hinge. 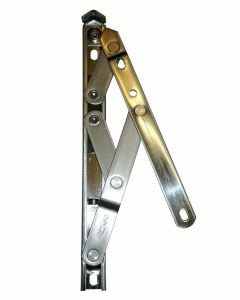 Slimline or narrow type hinges are friction hinges that have reduced the width of the hinge part that fits onto the frame part of the window only available as 13mm low stack height. 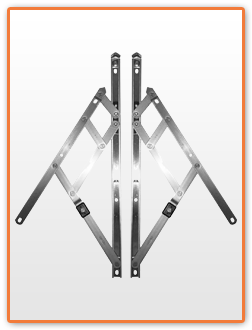 Certain profile manufacturers made their systems to suit these type of hinges only.